Blue atlas cedar trees are commanding evergreen trees with a rapid growth rate and open, pyramidal shape. Growing 60 to 100 feet tall and 40 feet wide, blue atlas cedars cast a significant amount of shade around the garden. Surrounding plants, when planted near a blue atlas, need to tolerate some shade, full or partial, in order to prosper. Because blue atlas cedar trees don’t produce colorful blooms, planting flowers nearby help to complement the garden. Cranberry cotoneaster (Cotoneaster apiculatus) is an evergreen ground cover with a slow to moderate growth rate and fine texture. Similar to the blue atlas cedar, cranberry cotoneaster tolerates a wide range of soil conditions, except wet. Cranberry cotoneaster has a low, spreading form and dark green leaves that thrive in sun to partial shade, ideal for growing around the blue atlas cedar that casts dense shade around the base. Growing 3 feet tall and 3 to 6 feet wide, cranberry cotoneaster’s bright red fall berries contrast with the silver to blue needles of the blue atlas cedar. Drought-tolerant, cranberry cotoneaster has small pink summer-blooming flowers that emerge to light up the garden. As an evergreen, cranberry cotoneaster retains its needles and color all year long, including winter, to complement the evergreen blue atlas cedar. The USDA hardiness zone for planting is 4 to 7. Like the blue atlas cedar, Hellebore (Hellebores x hybridus cvs.) is an evergreen plant that retains its color all year long. Frost- and heat-tolerant, hellebore flowers flourish in part to full shade, making them an ideal plant to grow around the blue atlas cedar. Hellebore flowers grow 1 to 3 feet tall and wide and prefer a range of soil types including, nutrient-rich, well-drained soil. 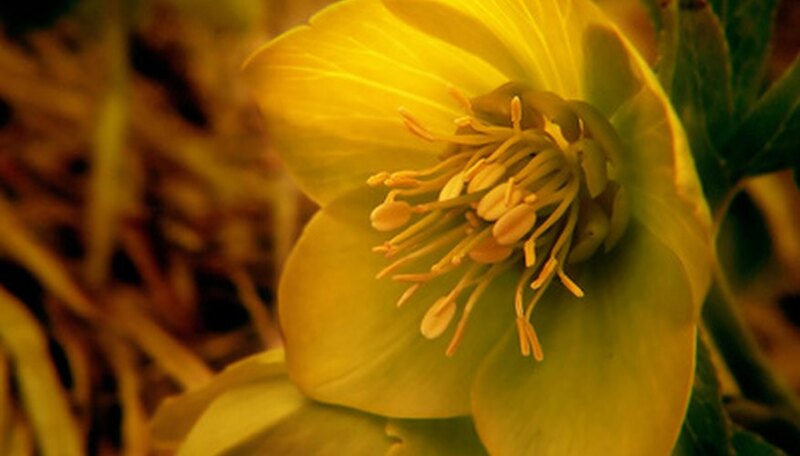 The bright blooms of the hellebore grow in a wide range of colors including, white, purple, green pink and yellow. Appearing as if they are nodding down to the ground, hellebore flowers emerge in February to last into spring. The leathery green leaves of the hellebore complement the blue atlas cedar to add much needed color to a dreary winter landscape. The zone for planting is 4 to 9. Korean rhododendron (Rhododendron mucronulatum) is a deciduous shrub with a slow growth rate and bright flower blooms. Planted next to the green to silvery-blue atlas cedar tree, the spring-blooming pink to purple colors contrast to create a showy landscape design. Growing 4 to 8 feet tall and wide, Korean rhododendron have an upright, oval form that is compact in shape, ideal planted in masses around the tree. The green leaves of the Korean rhododendron turn to fiery colors of yellow, red and bronze in the fall for a rich landscape display. The zone for planting is 4b to 7.